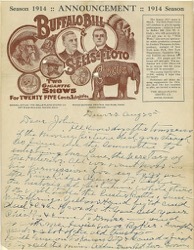 General Offices, The Sells-Floto Shows Co.
37 Symes Building, Denver Colo. The Season 1914 opens in March. 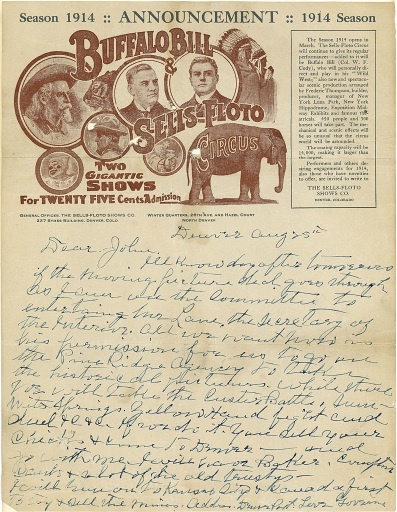 The Sells-Floto Circus will continue to give its regular performances—added to it will be Buffalo Bill (Col. W. F. Cody), who will personally direct and play in his "Wild West;" also new and spectacular scenic production arranged by Frederic Thompson, builder, producer, manager of New York Luna Park, New York Hippodrome, Exposition Midway Exhibits and famous theatricals. 450 people and 300 horses will take part. The mechanical and scenic effects will be so unusual that the circus world will be astounded. The seating capacity will be 14,000, making it larger than the largest. I will run on to Kansas City & Canada first to try & sell the mines. Address. Denver Post.